Portions extracted from the EIA-748-D © SAE International (with permission). Are you aware that a revision to the Society of Automotive Engineers (SAE) / Electronics Industry Alliance (EIA) Standard 748 Earned Value Management Systems, has been released? The new revision is SAE / EIA 748-D. Officials have been discussing the changes at recent industry conferences. ACTIVITY OR TASK: An element of work with an expected duration in the network schedule that is performed during the course of a project. Activities generally have expected resource requirements used to determine the budget for the work effort. One or more activities may relate to a work package. AUTHORIZED UNPRICED WORK (AUW): A contract scope change which has been directed by the customer’s contracting officer but has not yet been fully negotiated/definitized. It includes a value, excluding fee or profit, typically associated with the authorized, unpriced change order. ELEMENT OF COST (EOC): The categories of cost such as labor, material, subcontractor, and other direct costs as defined by company accounting practices. OVER TARGET SCHEDULE (OTS): A replanned schedule baseline that extends beyond contract milestone dates, delivery dates, or completion date. An OTS is usually accompanied by an increase in budgets resulting in a corresponding Over Target Baseline (OTB). It typically requires customer approval to implement. RISK AND OPPORTUNITY (R&O): An uncertain future event or situation that could impact the ability to achieve overall project requirements within defined cost, schedule, and technical objectives. Risk has two components: (1) the probability (or likelihood) of a particular outcome and (2) the consequences (or impact) of that outcome. The consequences of risks are typically thought of as negative that may need to be mitigated to minimize the impact to the project. A risk event with positive consequences is referred to as an opportunity that may be captured as a benefit to the project. SUMMARY LEVEL PLANNING PACKAGE (SLPP): An aggregation of far-term work efforts (scope, schedule, and budget) that are not able to be identified at the control account level but can be distributed to reporting level WBS elements. ESTIMATE AT COMPLETION (EAC): The current estimated total cost for authorized project work. It equals the cumulative to date Actual Cost of Work Performed (ACWP) plus the estimated costs to complete (Estimate to Complete or ETC) the authorized work remaining. LEVEL OF EFFORT (LOE): Support type activities that lack measurable output or product that cannot be discretely planned or objectively measured in a practical manner. LOE automatically earns performance with the passage of time, an earned value technique. MANAGEMENT RESERVE (MR): An amount of the total budget set aside for unplanned, in scope effort that may arise during the course of the project which cannot be identified in advance and is used to handle execution risks. Management reserve budget should be commensurate with the level of project risk. It is not part of the Performance Measurement Baseline (PMB). OVER-TARGET BASELINE (OTB): A Performance Measurement Baseline (PMB) that exceeds the Contract Budget Base (CBB). It is implemented to produce a realistic schedule and budget plan for the project’s remaining work. It typically requires customer approval to implement. In Section 3.2.1 WBS Dictionary, discussion regarding segregation by WBS element for direct costs has been removed. In Section 3.3.1 Control Accounts, discussion regarding guidance that a Control Account shall not span multiple WBS elements has been removed. In Section 3.3.1, a new figure, Figure 1 – Establishing Control Accounts was added. In Section 3.4.3 Subcontract/Procurement Schedules, the phrase “high risk” has been removed. In Section 3.8.2 Cost Performance, The Labor Rate and Efficiency variance calculations were corrected. The corrected equations are below. In Section 3.8.2 Cost Performance, the acronym “EAC” has been replaced with “ETC”. In Section 3.10.2 Authorized Changes, discussion regarding allowable changes for optimum utility has been removed. In Section 4 System Documentation, the term “GEIA” has been replaced with “SAE”. In Section 5.1, Evaluation Process, the term “officer” has been replaced with “authority”. 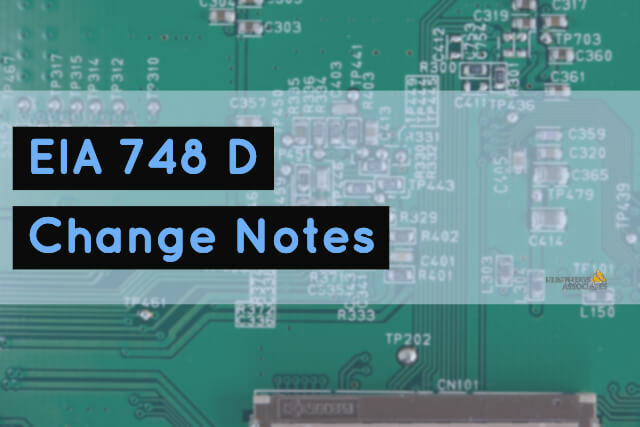 In summary, EIA 748-D has added/modified a few items for clarification but does not change any of the implementation, reporting, surveillance, or enforcement aspects of Earned Value Management Systems.